First Flights & Other Sorties at Mojave Airport Jack Conroy’s Pregnant Guppy – First Flight to Mojave! Many great ideas have been transferred from a person’s mind, through their fingers holding a pen, onto a paper napkin. That is exactly where a solution for hauling the S-1C rocket stage happened. The first stage of the American Saturn S-IV rocket was built by Boeing in 1961. One of our aviation friends is Clay Lacy and no one can tell a story like Clay. I remember asking him about flying the Pregnant Guppy and he has a way of tilting his head and you can see in his eyes, the memories are flowing back and as he relives the flight in words for you to hear. I’ll try to recollect some of his words and capture some of the essence of this program that touched our airport. One of Clay’s closet friends at Van Nuys Airport was John ‘Jack’ Conroy, a former U.S. Army Air Force B-17 pilot in World War II and California Air National Guard pilot. Conroy actually conceived the idea of joining two C-97 fuselages to create a larger inside diameter aircraft, that was ultimately named the ‘Pregnant Guppy.’ Jack knew that NASA was looking for ways to transport large components of the Saturn S-IV rocket. He also knew that Boeing 377 Stratocruiser’s were being phased out and his friend, Leo Mansdorf, an aircraft broker, was storing this type of aircraft at Van Nuys Airport. One night at the local airport restaurant at Van Nuys, I think it was called Sky Trails, these guys sat together talking about the different options that might be accomplished to haul the large rocket stages and how they might make a presentation to NASA with a solution. Of course, one of the guys grabbed a paper napkin and started drawing some ‘what if’ ideas. It was Jack Conroy who thought using the surplus 377 Stratocruiser’s was the answer by merging two 377s together, making the inside diameter of 19-feet. It was the only aircraft capable of carrying the 40-foot long, 18-foot diameter S-IV stage of the Saturn I rocket. 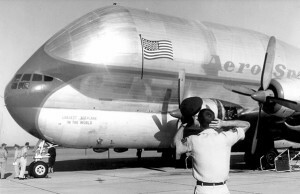 The Super Guppy over Mojave in 1962. The nose, cockpit, wing, engines and tail remained unchanged, while a new upper fuselage of approximately 16-feet was added, a whole cabin section of another 377. It gave the airplane a strange double or even triple-bubble configuration when seen from the front. The aft part of the airplane was detachable to allow the loading of large cargo. Conroy was so confident in his idea that he presented the concept of the highly modified Stratocruiser to officials at NASA. Even though they were not highly impressed, he was a visionary businessman and knew it would work. There was one person who showed keen interest and support: none other than Dr. Wernher von Braun. With that encouragement, Conroy went into debt by mortgaging his own home to pursue the project. He founded Aero Spacelines International and initiated the building of the concept aircraft. He had one customer in mind — NASA. They needed a way to transport oversized cargo and he knew he could deliver. The rocket components were too large to travel by rail, as tunnels were not large enough, and there was no way to move by trucks as bridges and roadways weren’t compatible. The only way, for the time being, was to place them on a barge and go through the Panama Canal, taking at least one month to get to Cape Canaveral. Aero Spacelines would transport the rocket components in one day. On-Mark Engineering was hired to begin the conversion work. The Pregnant Guppy was re-designed from an ex-PanAm airframe and a section from a former BOAC Stratocruiser was added on top behind the wing. The Pregnant Guppy, powered with four Pratt & Whitney R-4360-59 ‘Wasp Major’ radial engines, made its first flight to Mojave Airport from Van Nuys Airport on Sept. 19, 1962. Jack Conroy flew left seat and Clay Lacy was co-pilot. 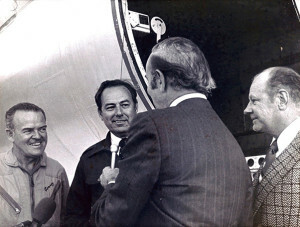 After the flight to Mojave, Conroy took the airplane on a demonstration tour and headed east with a final destination of the Marshall Space Flight Center in Huntsville, Ala.
Jack Conroy, Clay Lacy and Al Paulson being interviewed in Mojave after the “Pregnant Guppy” made its first flight in 1962. At that time, the aircraft was considered the world’s largest airplane. Von Braun was there to greet Conroy and his crew. As a pilot himself, von Braun was anxious to experience the flight qualities of the Guppy first hand. 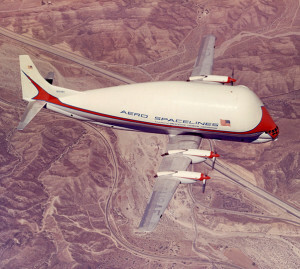 According to a NASA historical website, Conroy was determined to prove that the Guppy could fly with a heavy load, but there wasn’t time to fill the cargo bay with sandbags for simulation, so they just filled the aircraft with enough fuel to make up the weight difference. With high ranking officials shaking their heads, two MSFC observers were aboard the ‘heavy load’ test flight: Julian Hamilton, one of the key managers in the Saturn logistics programs and Herman Kroeger, a former test pilot and member of von Braun’s V-2 program group in Germany. The takeoff was uneventful and during the flight, the two port engines (number one and two) were shut down and the aircraft maintained course and altitude using only light controls. In his book, Lucky Me, Clay recalls that Wernher von Braun, director of NASA’s Marshall Space Flight Center and leader of the U.S. rocket development program, visited Van Nuys Airport twice to check on the aircraft’s progress and credited the Pregnant Guppy as “the single most important piece of equipment to put man on the moon in that decade.” Conroy’s engineers went on to develop the next generation of oversized aircraft, including the Super Guppy, a modified KC-97 Stratotanker with an outside diameter of twenty-six feet. A young machinist, Eber West, who formerly worked at XCOR Aerospace in Mojave, put together a collage of photos that hangs in the Voyager Restaurant and stirred memories in my mind of the many firsts that happened here at Mojave Air & Spaceport, back when it was simply — Mojave Airport. After the East Kern Airport District was formed in 1972, this significant and historical location, inspired and launched many aeronautical firsts. Eber’s collection of photos are actually shots of the Super Guppy of which his grandfather, Paul West, was the flight test engineer. Eber had numerous photos and an original Super Guppy sales brochure from his grandfather that he allowed me to copy. 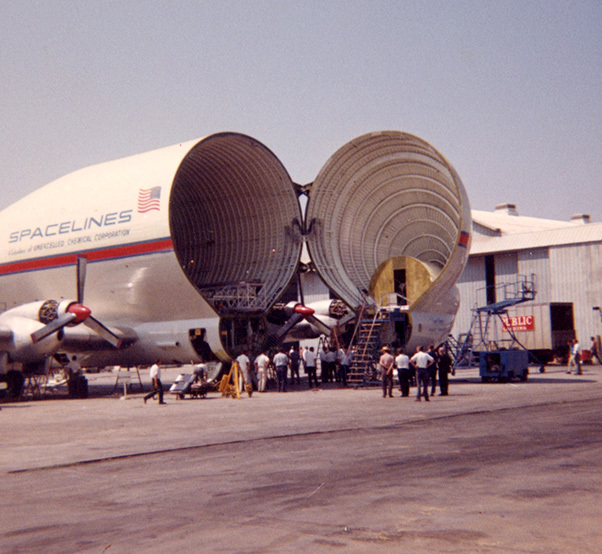 The Super Guppy had a total length of 141-feet 3-inches. Sections from four Stratocruiser’s, plus extensive new manufacturing, made up this larger aircraft. A 300-inch section was installed aft of the wing and a 70-inch section was installed in front of the wing, lengthening the basic Boeing Stratocruiser 30-feet, 10-inches. The Super Guppy on the flightline at Mojave. The top of the upper cargo compartment was raised from 8-feet, 10-inches to 25-feet, 6-inches above the floor. Ground height of the fuselage was increased from 19-feet, 1-inch to 36-feet, 6-inches. Diameter of the fuselage was expanded to create an inside diameter of 25-feet and an outside diameter of 26-feet along a constant section 31-feet in length, decreasing to a diameter of 10-feet, 8-inches at the aft bulkhead. Overall length of the cargo compartment was 94-feet, 6-inches. The vertical stabilizer with the rudder and dorsal fin was raised 58-inches and the vertical and horizontal stabilizer tips were extended 40-inches. 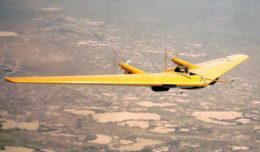 The total wing span was 156-feet 3-inches and a new center section was manufactured, increasing the wing span by 15-feet. The R-4360 reciprocating engines were replaced with Pratt & Whitney T-34 turbo prop engines, each capable of producing 7,000 total equivalent horsepower. The empty operating weight was approximately 105,000 pounds and gross takeoff weight was 175,000 pounds. The entire forward part of the aircraft, including the cockpit, opened 120 degrees, unlike the Pregnant Guppy that opened at the rear of the aircraft. Two massive hinges, each weighing almost 600 pounds, were actuated hydraulically for opening and closing. Aero Spacelines, Inc. was formed in November 1961 for the purpose of developing specialized cargo-carrying aircraft to transport outsize cargo, particularly space components. In July 1965, Aero Spacelines became a subsidiary of Unexcelled Chemical Corp., New York. John ‘Jack’ M. Conroy, who originally organized Aero Spacelines, remained as president and operating head of the wholly-owned subsidiary of Unexcelled. There are so many other first flight to remember at Mojave and exciting first flights will be taking place in the near future. The Pregnant Guppy was billed as The Largest Airplane in the World. Stay tuned for first flight of today’s Largest Airplane in the World at Mojave Air and Spaceport!